Allotment plots often suffer from a variety of pests and diseases, sometimes because of poor plant husbandry by previous plot holders. These problems include onion white rot, pea & bean weevil, pea thrips, slugs, snails, wireworm, greenfly, whitefly, blackfly, mildew, caterpillars, pigeons, mice, cabbage root fly, carrot root fly, potato blackleg, potato root eelworm and Club Root. It's a wonder that we manage to produce any harvest at all! One fungal disease that can be overcome is Brassica Club Root ( Plasmodiophora Brassica). 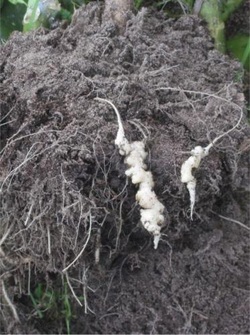 This pest is recognised by the large swellings on the roots of the plants and can seriously affect cropping. It's particularly bad on poorly drained acid soil. A treatment in the past was Calomel, but this product has been withdrawn for health reasons plus it isn't organic. My own plot was infected when I took it over. The swellings were so large that they broke through the surface and the rats came and ate them. The cure, which took several years to become fully effective, came in three parts. Most important was the use of lime in the form of ground limestone. This was applied to the brassica section in two stages. Six ounces per square yard in January and another similar application in May, shortly before planting out. The reason for two applications is that the beneficial soil organisms don't like sudden changes in soil pH. This lime made the soil slightly alkaline and the fungus didn't like that. With free draining soil on the site, rain leached out the lime so that it had become slightly acid in time for the later potatoes, and potatoes do like that. Second was the use of a strict four year crop rotation with all the brassicas being grown in the lime treated section. This rotation was chosen so that the brassicas came after the potatoes and gave the soil time to become slightly acidic for the next crop of potatoes in three years.. Also, by the time that the brassicas came round again, many of the fungal spores had died. Finally, but not essentially, all the brassicas were raised in a general purpose compost in Rootrainers. These composts are usually free of the fungal spores and give the plants a good healthy start. Now, club root is a thing of the past but I still follow this three pronged regime. Daunting is a word that often comes to mind when a new plot holder first sees their new allotment. The plot has often reached an advanced state of dereliction before the previous plot holder has given up. Easy to see are the ramshackle shed, the broken glass in the greenhouse, the piles of rubbish and the weeds. But often worse are the problems lying below the surface. Lots of sporadic enthusiasm, a lack of real commitment and experience plus poor crop rotation has led to a build-up of soil pests and diseases during the previous tenant’s tenure. 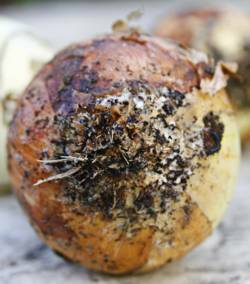 Onion White Rot (Sclerotium Cepivorum) is one of the most serious of these diseases. The first crop of onions reveals a fluffy white growth on the roots and the onion’s base. The fungus steadily eats into the onion making it unfit for use. The cure recommended is an eight year gap between crops of onions. My plot was infected when I took it over. Eradication is a slow process but can be achieved. Like most fungi it will eventually die. So how do you achieve an eight year rotation? I use a four year rotation on my organic plot. The plot is divided into four sections each 15 by 23 feet. In their section the alliums (onions, shallots and garlic) occupy 9 of the 23 feet. The 14 feet remaining has carrots and peas. So every fourth year I swap round the alliums with the carrots and peas. That gives an eight year rotation. Make and keep a planting plan each year. It’s easy to forget where the onions were four years earlier. I still get an occasional onion with a little white rot. These are removed, taken home and put in the wheelie bin. Importantly, they are not composted. So far the leeks, a more robust allium, have had no white rot. Their section comes the year after the onions. They also take up less than half of their section and have a similar eight year rotation. Don’t expect eradication after the first eight year cycle, but after that White Rot will be a decreasing problem. Even for non-organic gardeners there is no suitable chemical solution.